Macwold UK reports on a recent survey carried out by Solutions Research Group which looks at the likely demographic of US purchasers of the iPhone. The results are based on an online survey of 1,230 American consumers in May 2007, and reveal some interesting, though arguably predictable results, about who said they would buy the $499 device. 72 % of early adopters will be male with an average age of 31-years. 58 % will have completed college, and that they will have higher incomes than most US consumers. The research claims iPhone user’s $75,600 per year household income will be 28 % higher than the national average. 48 % of potential buyers don’t currently own an iPod. Residents of tech-savvy regions, New York and California, will account for 43 % of total first wave iPhone buyers. So your average iPhone early adopter will be male, in their late 20s to early 30s, affluent, and live on the East or West coast. I fall generally into the demographic portrayed in those results, and, predictably, am excited about the iPhone. However, if I can resist long enough, I am going to wait for version two. 3G is undoubtedly on the way, and I don’t want to lock myself into a 2-year contract when a certain upgrade will be rolling out shortly. My BlackBerry Pearl is holding up fine in the interim. I know the iPhone is about that huge touch-screen interface, but that’s exactly why I am skeptical that iPhone can live up to its hype. I had a touch-screen phone before, and the problem is not that I misses the keys. Instead, the problem is that I miss the feeling of a hardware keyboard. Remember the mighty mouse? It’s a mouse with clicks, and how many people actually buy it? Or imagine a computer keyboard with a touch screen. Even with the most intelligent algorithm that can predict or correct what we type wrong, I don’t think people would like it. Human interface design is more of an art than a science. 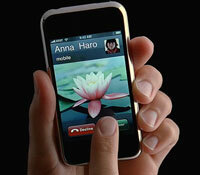 We will see if Apple can replace keys with touch screens.